Order in the next 1 hour, 12 minutes an 0 seconds for same day shipping. 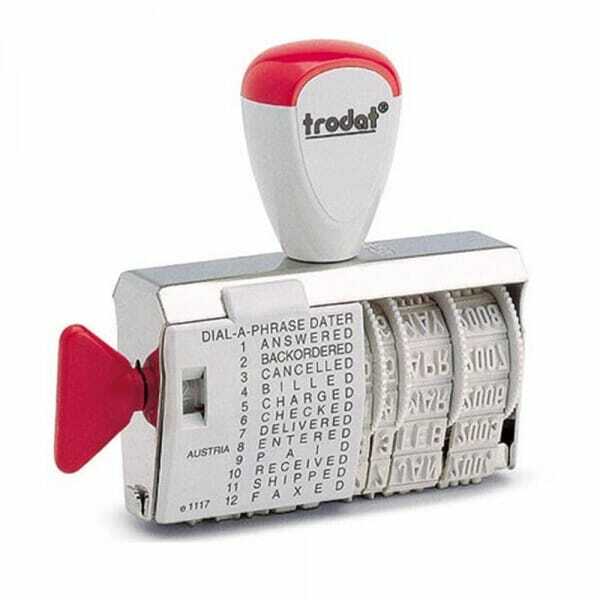 This traditional rubber stamp features a date setting and 12 words commonly used on office paperwork. The 12 phrases include: ANSWERED, BACKORDERED, CANCELLED, BILLED, RECEIVED, CHARGED, CHECKED, DELIVERED, ENTERED, PAID, SHIPPED and FAXED. The text prints in front of the date. The date has the height of 4 mm and the format: day, month (in letters) and year. The size of the impression is 50 x 5 mm. Trodat Classic stamps are used with separate stamp pads which are available in black, red, blue, green and violet. Customer evaluation for "Trodat Classic 1117 - 4 mm date + choice of 12 words"